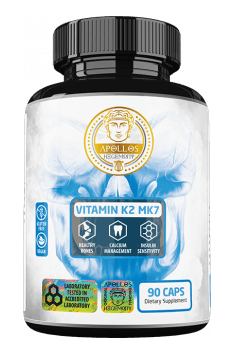 Apollo’s Hegemony K2 Mk7 is a dietary supplement containing 100 mcg of vitamin K2 in the form of Mk7 per capsule. Vitamin K2 (menaquinone) – a fat-soluble substance of the K complex, it has difarnesyl residue or other isoprene groups in the third position. It is produced mainly in fermentation processes, as well as in the lumen of the intestine by natural bacterial flora. Small amounts of K2 Mk7 can be converted from vitamin K1 (phylloquinone) with the aid of bacteria Escherichia coli. The main activity of vitamin K2 consists in activating osteocalcin – a hormone produced by osteoblasts that supports the transport of calcium to bones and exhibits many other properties beneficial for health. The activity of vitamins K1 and K2 is fundamentally different and they should not be confused. Vitamin K1, commonly just called vitamin K, is responsible mainly for regulating blood coagulation processes. On the other hand, menaquinone, vitamin K2, exhibits the property to a much smaller degree; however, it is an important player in calcium management in the organism. The form Mk7 is characterised by a longer molecule chain as compared to the popular form – Mk4. Thanks to that, its release is longer and the increase of the vitamin in the blood is more stable. Mk7 also requires much smaller doses to achieve proper efficacy. For example, the minimum efficient dose of Mk4 is 1,500 mcg, although therapeutic doses reach up to 45,000 mcg; on the other hand, efficient doses of Mk7 are even 90-360 mcg. Vitamin K2 is a popular complement to vitamin D3 supplements, as it reduces the risk of potential damage caused by large doses of cholecalciferol. Vitamin D significantly improves calcium absorption, which can pose a problem if its use by the organism, that is its transport to bone tissue, is not optimised. Menaquinone comes in handy thanks to its ability to activate the hormone produced by bones – osteocalcin. The substance is responsible for calcium transport to teeth and bones, where it is needed most. That way, the amount of free calcium circulating in the blood decreases. Apart from reducing damage, both vitamins can stimulate each other’s activity, for example, when it comes increasing testosterone levels, improving insulin sensitivity, or protecting the nervous system. One of the diseases of affluence that are particularly problematic for seniors is atherosclerosis. Contrary to the common belief, cholesterol levels are not the only factor that can contribute to the formation of atherosclerotic plaque in blood vessels. Elevated calcium levels can also prove problematic; calcium can be deposited in soft tissues, such as vessel walls, and make them stiff. Calcifications can also contribute to an increase in blood pressure and the breaking of capillaries. Osteocalcin produced by osteoblasts and stimulated transport of calcium to bones translates into greater bone mineral density and their tougher structure. Another vitamin K-dependent factor that directs calcium ions to the right places is Matrix Gla Protein (MGP). Activating the two factors allows more efficient distribution of calcium in the organism, delivering it exactly where it should be. As research shows, menaquinone supplementation significantly reduces the risk of fractures. Vitamins K are present in the brain, where their beneficial activity can also be experienced. The most important property is their neuroprotective effect, preventing the death of cells caused by various factors. Among them are some types of oxidative stress, including that caused by mercury, and excitotoxicity induced by the excessive activity of glutamate. Inhibiting the enzymes 12-LOX helps to reduce inflammations in the brain. Moreover, vitamin K, similarly to vitamin D, helps to protect neurolemmas, which is particularly important for people struggling with multiple sclerosis. Scientists have demonstrated a correlation between low vitamin K levels and distorted cognitive processes in seniors. The protein hormone has many other interesting properties that go beyond just calcium management. One of them is its ability to stimulate Leydig cells in nuclei, thanks to which they can produce more testosterone, which should be particularly interesting for men struggling with low levels of the androgen and fertility problems. Osteocalcin also affects insulin production by pancreatic beta cells and their proliferation, stimulating adiponectin release from adipose cells, thanks to which insulin sensitivity is improved. Apollo’s Hegemony K2 Mk7 is recommended particularly for people with an increased risk of circulatory system diseases, especially atherosclerosis. It can also efficiently increase bone mineral density and toughness, which is useful in preventing osteoporosis and in other diseases of the musculoskeletal system. A common practice is combining vitamin K2 with larger doses of vitamin D3 in order to reduce the risk of complications and achieve synergy. Vitamin K2 MK7 90 caps. Take 1-2 capsules a day, preferably with a high-fat meal. The recommended dosage that efficiently increases the level of the vitamin ranges from 90 to 360 mcg, so the dosage of the supplement should be 1 to 3 capsules a day, depending on the purpose of using it. Vitamin K2 is usually used as a complement for vitamin D3 supplementation. In that case, it is good to include at least 100 mcg of K2 for every 5,000IU of vitamin D.
2-3 capsules a day are worth taking when there are already calcifications and stiffness of blood vessels, as they can help to reverse the effect. The dose can also be used for strengthening the bones and reducing the risk of osteoporosis. When it comes to preventive healthcare and supplementation, one capsule a day should suffice. The time of taking the supplement is not clearly defined, it should be adjusted to the effects achieved. For better absorption of the vitamin, it is recommended to take the capsules during or right after a high-fat meal.